You can not reconstruct the memories of your wedding from photos alone. Wedding Comments. You can not reconstruct the memories of your wedding from photos alone. Your wedding is one of the most special life events you will experience. Allow us to preserve those memories for you with video. Capture the special and cherished moments of your life, using a wedding videographers in Puerto Vallarta. 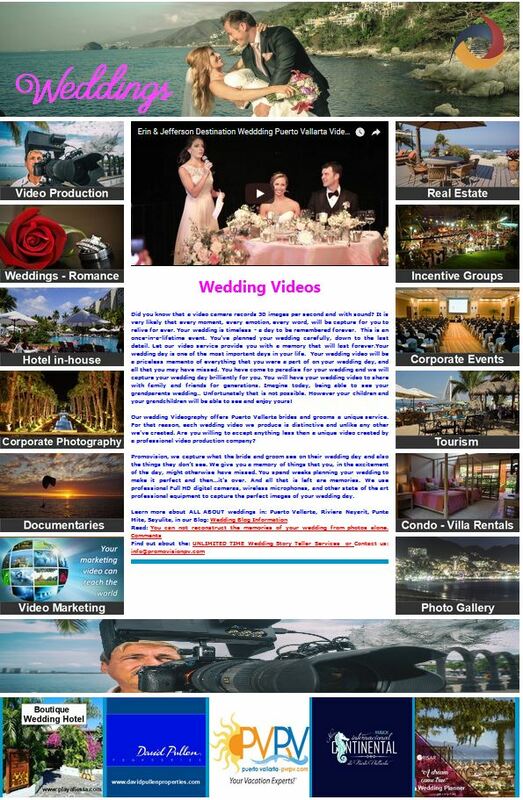 We are passionate about producing the highest quality digital wedding videos available at the lowest possible price. Nothing can preserve a memory as perfectly as video; your wedding memories can be recorded and saved for a lifetime. joyous celebration as we respect the intimacy of this special occasion. When you come to Puerto Vallarta to celebrate your LOVE, it magically becomes a part of you. parents and friends, we try to work as unnoticed and candid as possible. •• Thanks again for the effort you put into our wedding video. We really enjoyed watching it last night and it turned out great. •• Ray, we received the video today and it is wonderful! Thank you so much for all your hard work! •• Once again, thank you for the video and sending me the raw footage. Everyone absolutely loves the video and they say it is one of the best wedding videos they have ever seen. Because its not over the top like most other videos. •• Steve and I would like to thank you dearly for your beautiful video work for our wedding last month (Jennifer Ortega and Steve Cohn wedding on May 17th at Le Kliff Restaurant (booked through EM-Vallarta prior to venue change). It was a pleasure to meet you and we sincerely appreciated both your work and your service. We were so happy that you were able to meet us at the airport with the DVDs of your edited versions of our wedding video. •• Wow that was fast! Thank you so much for everything Ray. Ray! We love the video! You did such an amazing job with the music, the special effects, everything was so great. THANKS SO MUCH, we are both very pleased. •• We received the video and it is AMAZING! We absolutely love it! Please send our compliments to Promovision. We are so happy with their work. We are just so happy with everything! Thanks again for all your help. •• We received the video and we were very impressed. They did an excellent job, and I would recommend them to anyone looking for the same thing. if we can ever write a review for you… for your Web site, brochure or anything else. We’d be more than happy to do so. •• Ray, we received the wedding DVD’s! They came out amazing! Thank you so much. You got some incredible footage. •• The video is great, they do a wonderful job! •• I absolutely love the videos! Thank you so so much, you did a fabulous job and I love watching the videos, you captured so many special moments! Thanks again!!! •• Thanks again for all your help. the DVDs look amazing! •• I would like to order additional copies of Sara A. Traylor and Joshua B. Hawkins wedding video. Can you please send me information on how I can do this? Thank you. You did an incredible job on this video! •• We just watched the video for the first time and it is absolutely AMAZING!!! THANK YOU SO MUCH!!! We are so happy that we found you and can relive the most wonderful day of our lives over and over. •• Wanted to write and let you know how much we LOVE the wedding video from our wonderful wedding day at China Blanca. It is absolutely amazing – captured every moment so beautifully. Words can’t express how grateful we are to have such a beautifully done record of our special day. I hope all is going well for you and if you ever need a reference, please feel free to use us! •• Hi Ray, we just wanted to drop you a quick line to let you know how thrilled we both are with the DVD of our wedding. It is fantastic – we both got quite choked emotionally when we saw it. We both thought the choice of songs was great too. We can’t wait to show all our friends. Thank you again and best wishes for the future. •• Ray: I wanted to tell you what an absolutely OUTSTANDING job you did with our wedding video. It is excellent – absolutely top knotch. Thank you, you truly did a fantastic job with the video and the coverage. •• I apologize for the delay in getting back with you! It has been go, go, go since we got back. We absolutely loved the video. We still tear up watching it and we’ve already gone through many viewings with friends/family. You were able to capture everything so perfectly without being a distraction. I love your creativity and style with the choice of music, angles and colour vs. black and white. I will highly recommend you on the chat boards that I belong to! I will let you know if we’re ever in PV again soon! •• I just wanted to let you know that we LOVE the video! it was so great to watch our wedding again and I think you did a great job editing it. I’ve shared by video with so many people and everybody raves about it. I also told all the brides that I know who are getting married in PV to contact you for services. •• Just got the DVDs! Thank you so much……It makes all of us cry tears of joy when we look at it. It’s perfect! WORLD´S TOP TOURISM DESTINATIONS – MEXICO. Our congratulations and good luck!